Ordinary progressive lenses are designed to work for a large number of patients with different prescriptions. 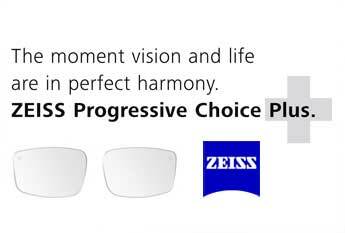 Each ZEISS Progressive Choice Plus lens is designed exclusively for one prescription and one patient. Which do you think will give you better vision? Each ZEISS Progressive Choice Plus lens combines over 100 years of ZEISS innovation in eyeglass lenses with our revolutionary, patented lens customization technology. Together, they deliver a superior all-distance viewing experience created specifically for your vision needs. Ordinary lenses are designed for an average prescription, not for yours, so chances are they won't provide ideal clarity. ZEISS Progressive Choice Plus are designed to your exact prescription, so the optics will perfectly match your vision needs. Perfectly matched to your frames. Frames come in a wide variety of sizes and shapes. For best visual experience, the distance, intermediate and near viewing zones need to be sized to fit the frame. Unlike ordinary progressives, ZEISS Progressive Choice Plus lenses are designed to fit the frame you choose, so you'll always have a complete, balanced viewing experience. Available for sports frames. ZEISS Progressive Choice Plus Sport lenses can be designed to optimize visual performance in "wraparound" sports frames.